The U.S. mainstream media’s near universal demonization of Syrian President Bashar al-Assad and Russian President Vladimir Putin – along with similar hatred directed toward Iran and Hezbollah – has put the world on a path toward World War III. Ironically, the best hope for averting a dangerous escalation into a global conflict is to rely on Assad, Putin, Iran and Hezbollah to show restraint in the face of illegal military attacks by the United States and its Mideast allies inside Syria. In other words, after the U.S. military has bombed Syrian government forces on their own territory and shot down a Syrian warplane on Sunday – and after Israel has launched its own strikes inside Syria and after Saudi Arabia and its Gulf allies have financed and armed jihadists to overthrow Assad – it is now up to the Syrian government and its allies to turn the other cheek. Of course, there is also a danger that comes from such self-control, in that it may encourage the aggressors to test the limits even further, seeing restraint as an acceptance of their impunity and a reason to ignore whatever warnings are issued and red lines drawn. In this upside-down world of American hegemony, Assad becomes the “aggressor” when he seeks to regain control of Syrian territory against armed insurgents, dominated by Al Qaeda and Islamic State (ISIS), or when he protests the invasion of Syrian territory by foreign forces. 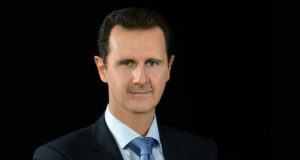 When Assad legally seeks help from Russia and Iran to defeat these foreign-armed and foreign-backed jihadists, the U.S. mainstream media and politicians treat his alliances as improper and troublemaking. Yet, the uninvited interventions into Syria by the United States and its various allies, including Turkey and Israel, are treated as normal and expected. So, you have Tuesday’s Wall Street Journal editorial, which praises Sunday’s U.S. shoot-down of a Syrian military plane because it allegedly was dropping bombs “near” one of the U.S.-backed rebel groups – though the Syrians say they were targeting an Islamic State position. Although it was the U.S. that shot down the Syrian plane over Syria, the Journal’s editorial portrays the Russians and Syrians as the hotheads for denouncing the U.S. attack as a provocation and warning that similar air strikes will not be tolerated. “The risk of escalation is real, but this isn’t a skirmish the U.S. can easily avoid. Mr. Assad and his allies in Moscow and Tehran know that ISIS’s days are numbered. They want to assert control over as much territory as possible in the interim, and that means crushing the SDF [the U.S.-backed Syrian Democratic Forces]. “The Russian threat on Monday to target with anti-aircraft missiles any U.S. aircraft flying west of the Euphrates River in Syria is part of the same intimidation strategy. Russia also suspended a hotline between the two armed forces designed to reduce the risk of a military mistake. Iran, which arms and assists Mr. Assad on the ground, vowed further Syrian regime attacks against SDF, all but daring U.S. planes to respond amid the Russian threat. “The White House and Pentagon reacted with restraint on Monday, calling for a de-escalation and open lines of communication. 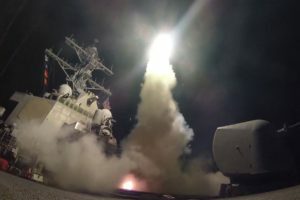 But if Syria and its allies are determined to escalate, the U.S. will either have to back down or prepare a more concerted effort to protect its allies and now U.S. aircraft. As senior U.S. commanders have explained, however, the notion of a sweet-sounding “no-fly or other safe zone” would require a massive U.S. military campaign inside Syria that would devastate government forces and result in thousands of civilian deaths because many air defenses are located in urban areas. It also could lead to a victory for Al Qaeda and/or its spinoff, Islamic State, a grisly fate for most Syrians. But the “safe zone” illusion has great propaganda value, essentially a new packaging for another “regime change” war, which the neocons lusted for in Syria as the follow-on to the Iraq invasion in 2003 but couldn’t achieve immediately because the Iraq War turned into a bloody disaster. 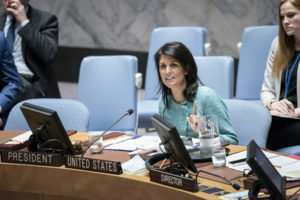 Instead, the neocons had to settle for a proxy war on Syria, funded and armed by the U.S. government and its regional allies, relying on violent jihadists to carry out the brunt of the fighting and killing. When Assad’s government reacted clumsily to this challenge, the U.S. mainstream media depicted Assad as the villain and the “rebels” as the heroes. Only in 2014, when Islamic State militants began decapitating American hostages and capturing cities in Iraq, did the Obama administration reverse course and begin attacking ISIS while continuing to turn a blind-eye to the havoc caused by other rebel groups allied with Al Qaeda’s Nusra Front, including many outfits deemed “moderate” in the U.S. lexicon. But the problem is that almost none of this history exists within the U.S. mainstream narrative, which – as the Journal’s neocon editors did on Tuesday – simply depicts Obama as weak and then baits President Trump to show more military muscle. But why isn’t this in U.S. national interests? What’s wrong with a unified secular Syria that can begin to rebuild its shattered infrastructure and repatriate refugees who have fled into Europe, destabilizing the Continent? As usual, the neocon armchair warriors don’t reflect much on what could happen if U.S. warplanes attacking inside Syria are shot down. One supposes that would require President Trump to authorize a powerful counterstrike against Russian targets with the possibility of these escalations spinning out of control. But such craziness is where a steady diet of neocon/liberal-hawk propaganda has taken America. We are ready to risk nuclear war and end all life on the planet, so Israel and Saudi Arabia can shatter a “Shiite arc of influence” and so American politicians don’t have to feel the rhetorical lash of the neocons and their liberal-hawk sidekicks.